Nicole's Needlework: Pure in Heart Finished! I finished up this little thread pack today. It was a fun stitch. I've missed stitching LHN designs. They are so simple and sweet. 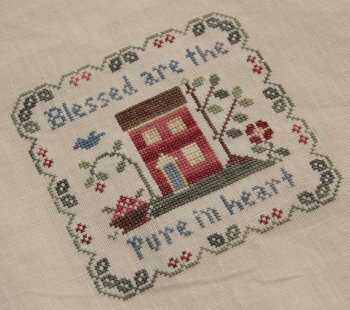 Little House Needleworks "Blessed are the Pure in Heart"
Well, the school year is almost over and we'll be headed down to Florida on Monday. Deb and I have already decided on a day to meet! I can't wait! I'll be taking a little blogging break until I get back. I will still try to upload pictures to my album. I just know I won't have time for blogging for awhile. Write as soon as I can! This is so sweet! Beautiful stitching! This turned out so beautiful Nicole! You just get so much done!! I love it! How long will you be in Florida? I hope you have a wonderful time!! Great Finish!! Have a safe and wonderful trip back to florida. It is so sweet, Nicole!! Have fun in Florida, you will be missed. Darling finish! Have fun in Florida! Terrific! I love how the shading in the house turned out!! Have a great time in Florida! Love it! Her designs are so wonderful and quick! Wow you are quick!!!! It is adorable!!!!! great job...you are so fast! Hope you have a safe, great trip. It's beautiful! I love LHN too! Hope you have a fun trip! Lovely finish! I agree, LHN designs are such a pleasure to stitch. Very nice! Have a wonderful time in Florida. Another pretty finish, Nicole!! The colors are pretty in this one. Nicole, you continue to amaze me with your quick work on these stitching projects you turn out. They are simply beautiful and you seem to accomplish them so quickly! Have a good trip to Florida. And happy summer! Beautiful, Nicole! Can't wait to see how you put them all together on one piece of fabric. Have a great trip and we'll all miss you. Your LHN piece is so adorable! What a nice little finish. Those small LHN projects are perfect for stitching in between big samplers. And of course one needs a regular dose of LHN stitching, lol. Beautiful finish Nicole. Those little LHN designs are so pretty. A lovely little finish, Nicole. Enjoy your time in Florida and have fun catching up with Deb. Cute finish!!! Have a wonderful trip to Florida! Adorable finish, Nicole! I hope you have a great trip & will miss you during your break! That turned out really sweet Nicole :) Have a great time in Florida! Beautiful finish. I love your idea of stitching these all together on one piece of fabric! That is a gorgeous piece! I may have to add it to my wish list! You done beautiful stitching on it! Have a great time in Florida!! Lovely finish! Have a wonderful time in Florida! And you get to meet up with Deb for stitching - how great is that! Pretty finish Nicole. Enjoy your trip. Hello, Nicole. I just discovered your blog (see my comment, the last one, I think, on your May 23rd post). Your work is exquisite! Do you work in hand or in a frame? Do you have multiple projects going? What is your secret for stitching so much, and so beautifully? Your stitching and shopping day sounds really lovely. Enjoy your time in Florida and have a great visit with Deb! Yet another gorgeous finish! Congratulations. Nicole, it is such a sweet design, and you finished so quickly! I hope you have fun in Florida. WAve when you drive by the Forsyth, GA exits on I-75. Can't wait to see what you stitch while you're away (and what you'll find on shopping trips). Have fun! Great finish, I just love their designs. Lovely finish! Enjoy your vacation to the sunny state of Florida!